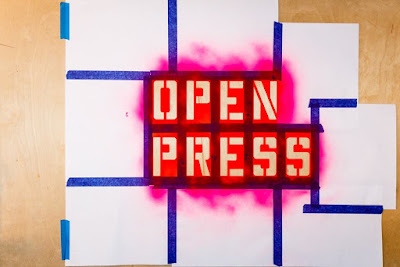 Open Press is a medium to extend the work of the writer, editor, and curator, to instigate new channels of reciprocity among those interested and engaged in what might constitute the literary at any given time. Over the course of three days, Open Press 2016 will feature roundtables, readings, panels, performances, a moveable book fair, and more in various locations across the Los Angeles area. The Poetic Research Bureau, eohippus labs, ENTROPY, & Insert Blanc Press. Wonder, KRUPSKAYA, Les Figues Press, Hex Presse, Portable Press @ Yo-Yo Labs, DUM DUM Zine, Primrose Press, Econo Textual Objects, Copilot Press, ypolita press, MONDO BUMMER, Outside Gallery, Phoneme Media, Tripwire, Círculo de Poesía, Valparaiso Editions, Unnamed Press, Rebel Hands Press, Los Angeles Contemporary Archive, The Unwrinkled Ear. Stephanie Sauer, Raquel Gutiérrez, Tia Blassingame, Carrie Hunter, Amy Berkowitz, Amanda Ackerman, Harold Abramowitz, Andrea Quaid, Michelle Detorie, Brenda Iijima, Taleen Kali, Teresa Carmody, Janice Lee, Ben Fama, Syd Staiti, Trisha Low, Lauren Levin, Kim Calder, Joseph Mosconi, Andrew Maxwell, Mathew Timmons, Greg Curtis, David Shook, Roberto Castillo, Mijail Lamas, Olivia Taylor Smith, Jeremy Kennedy, j. shelley harrison, mark rice, Guan Rong, Eric Kim, Andrew Choate, Kathleen Kim, Brian Griffith, Monica McClure, Sun Araw, Aaron Beasley. Insert Blanc Press & Outside Gallery are located around the corner and adjacent to the backhouse at 2806 1/2 Lincoln Park Ave., a more accurate yet fictitious address would be 3613 Pomona St., Los Angeles, CA 90031.
eohippus labs will be hosting a panel that wishes to ask how publishing is an act of writing with Raquel Gutiérrez of Econo-Textual Objects, Stephanie Sauer of Copilot Press, Tia Blassingame of Primrose Press, Carrie Hunter of ypolita press, and Amy Berkowitz of MONDO BUMMER! -- Panel will be moderated by Andrea Quaid. Food Intermission: Food & drinks & delicious edibles, catered by SOO N Food! Entropy will be hosting a panel on interspecies communication with Brenda Iijima of Portable Press at Yo-Yo Labs, Teresa Carmody of Les Figues Press, Taleen Kali of DUM DUM Zine, & Michelle Detorie of Hex Presse. Dim sum will be provided. It is much awaited revolution which will surely help new writers, editors. how to generate free roblox robux from this site for free. Thanks for delivering like fantastic data! !